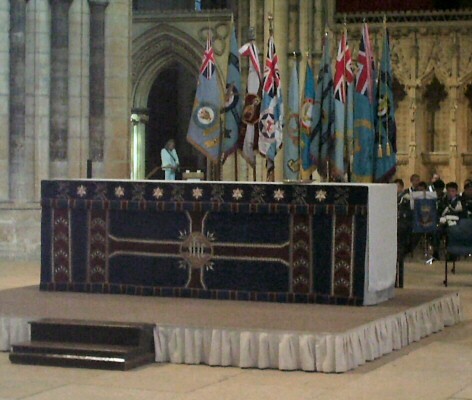 This memorial, in the form of a ledger stone, was unveiled by two veterans, Douglas Hudson DFC and Mrs Sylvia Watts during Choral Evensong in Lincoln Cathedral, on Sunday 27th August 2006. Malcolm Staves Wireless Operator 1/45-3/47 was accompanied by his son. 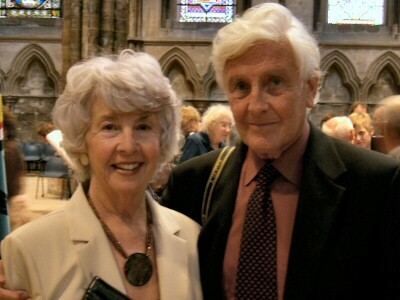 Brian Goulding, a Friend member and co-author of well known books on the Lancaster, was also present with his wife Mary. The Committee of the Association was represented by another Friend Member, Frank Haslam jr, Membership & Reunion Secretary, Newsletter & Website Editor, son of Frank Haslam snr Wireless Operator 4/44-6/44 who was shot down on 21/22 June 1944 with the Solly crew in Lancaster EM-M LL973: he evaded capture; three of his crew were killed, two were taken PoW and one other evaded. 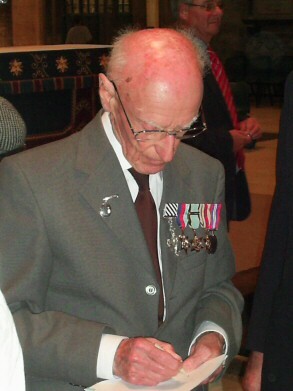 Bill Green, a Friend member and chairman of the Fenland Branch of Bomber Command Association, had to be at a family do on the day. He was one of those involved in the ticketing for the event. 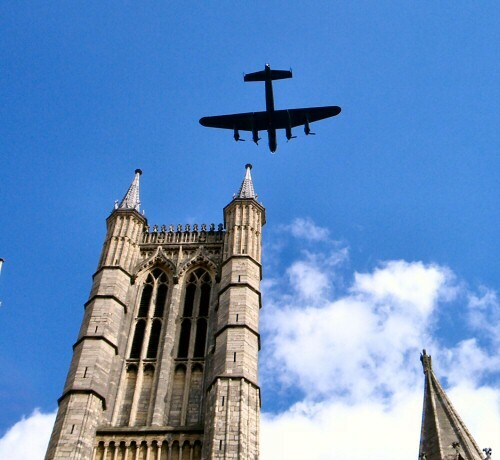 The BBMF Lancaster made three passes over the Cathedral commencing at 1505, which was very popular with the crowds of veterans and visitors to the Cathedral. PA474 is seen here on its final pass, W-E. 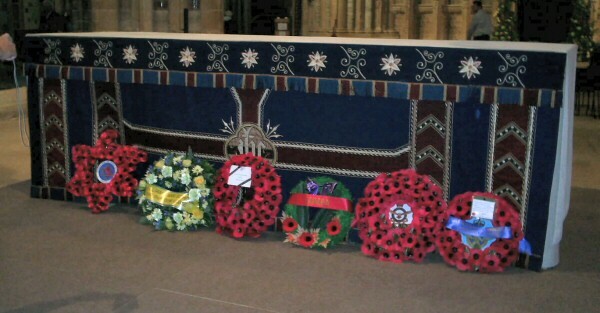 The service began at 1545. John, Frank and Roy found themselved sitting behind OC Battle of Britain Memorial Flight, Sqn Ldr Al Pinner and his family. Roy is a volunteer guide with the BBMF at RAF Coningsby. 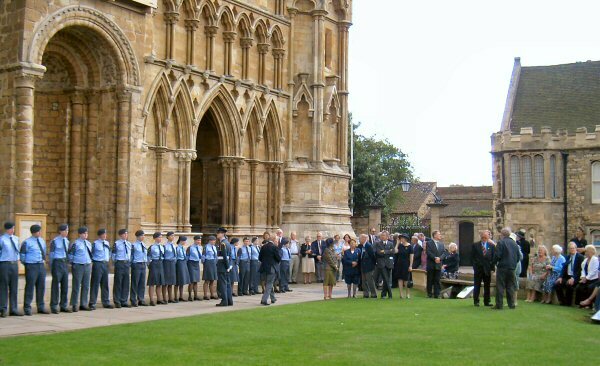 Trent Wing, Air Training Corps, were proud to be associated with this event, providing personnel and musical support. 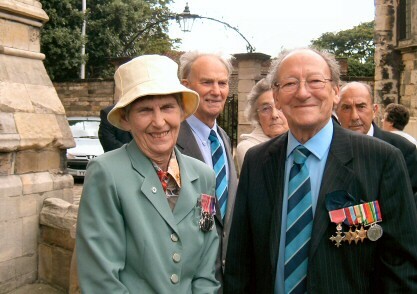 Lancaster author Brian Goulding and the late Mary Goulding: Brian works closely with the Aviation Heritage Centre at East Kirkby, where he would be the following day. 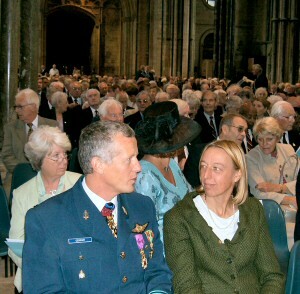 Brian was a Friend member of 207 Sqn RAF Association and attends our annual Dinners. 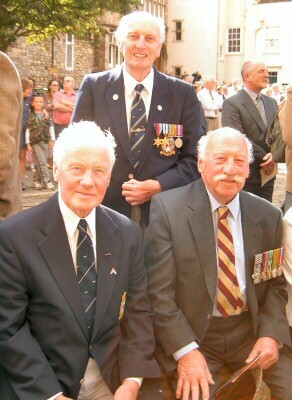 Roy Hill, Malcolm Staves, John Mitchell of 207 Squadron: WOps all. On 3rd September 1939 the British Prime Minister, Neville Chamberlain, stated that our country was at war with Germany. Our small island stood alone, facing an implacable enemy, the ruthless, strongly-fortified Nazi Germany war-machine. Heroically brave young men, aged nineteen to twenty-three years, prepared to sacrifice their lives in defence of freedom. Supported by other dedicated men and women, they volunteered to fly and take the fight to the enemy. 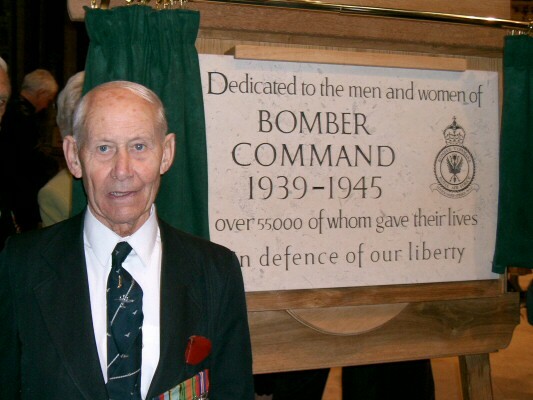 World War Two Bomber Command was created by necessity and was nurtured by expediency. Young men and women left their civilian occupations and entered extensive training in the Royal Air Force. They joined the regular, trained aircrew officers, senior NCOs and other serving personnel. Early in 1940 many volunteer reservists had qualified to combine with regular service personnel to fly operationally against the enemy. 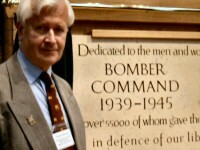 Volunteers from Australia, New Zealand, Canada, South Africa, India, Poland and Czechoslovakia, who had evaded the Nazis, together with Free Frenchmen and others from occupied Europe, swelled the increasing numbers in Bomber Command. A combined force, to be reckoned with by the enemy, was growing despite horrific losses sustained in training and operational missions. During the early years of the war, the difficulties of long-distance, hazardous day and night-time operational sorties were exacerbated by a lack of navigational aids, yet these continued with growing intensity. Nevertheless, the activities of crews, often dissatisfied by the inaccuracy of bombing and distressed by growing losses, proved to be of great public relations value. 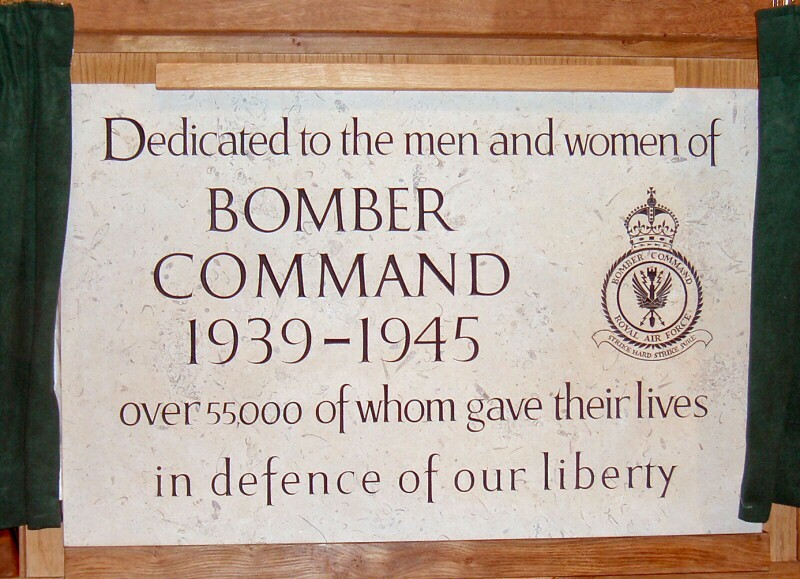 Bomber Command received accolades when Sir Arthur Harris launched the Thousand Bomber Raid on Cologne in May, 1942. This was followed one year later by the Dambuster Raid from Scampton, when fifty-six brave airmen failed to return after dropping the bouncing bomb and breaching three dams. A similar number of men from 101 Squadron at Ludford Magna was lost on the infamous Nuremberg Raid on 30/31 March, 1944. The raids on Nazi Germany and targets in occupied territories became considerably intensified in 1943 and 1944. Bombing was difficult from 23,000 feet, but accuracy improved with the advent of more sophisticated radio and radar navigational aids, causing significant damage to the German infrastructure and paving the way for the D-Day invasion. Losses were tragically high and from 16th February to 31st March 1944 458 heavy bombers were lost, accounting for over 3,000 air crew. Between lst January 1944 to the time of the D-Day landings on 6th June 1944 the Command lost over 1,500 heavy bombers, a toll of 10,500 men. 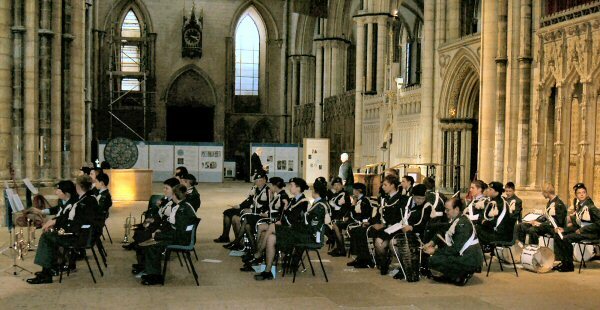 Here are some excerpts from the service ..
by the Subdean of Lincoln, The Reverend Canon Alan Nugent. Beloved, we are come together in the presence of almighty God and of the whole company of heaven to offer unto him through our Lord Jesus Christ our worship and praise and thanksgiving; to make confession of our sins, to pray, as well for others as ourselves, that we may know more truly the greatness of God's love and show forth in our lives the fruits of his grace. As we do so today, we remember with profound thanksgiving the contribution made by the members of Bomber Command in this County*, and the sacrifices made by them and by their families to the cause of justice, freedom and peace. We do - this in the context of a world still torn apart by greed, war and violence. Let us therefore turn to Christ, who offered his own life as a ransom for many, that we might receive forgiveness of our sins and learn to live in peace and love together. Lie in the dark and listen. Riding the icy, moonlit sky. Deep in the earth they've left below. Lie in the dark and listen. Lie in the dark and listen. Theirs is a world we'll never know. Just turn over and try to sleep. 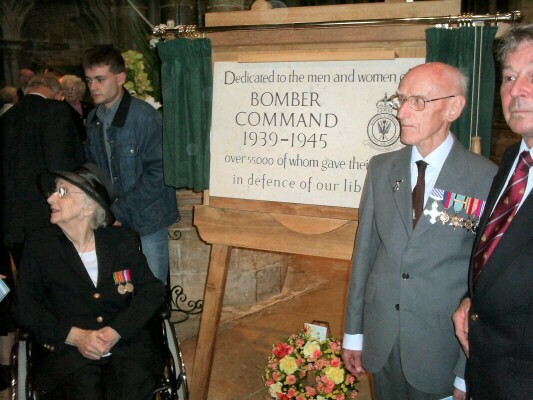 Two Bomber Command veterans, Douglas Hudson DFC and Mrs Sylvia Watts, unveiled the ledger-stone. Douglas was a Navigator. During a flight to ferry a 101 Squadron Blenheim to Heliopolis via Malta in 1940 "…we were bang on track for Malta, but it was too far with our fuel almost exhausted. John (Riddick, the pilot) overruled an option to continue and quite rightly turned the aircraft round and flew a reciprocal course for the North African mainland. With one engine cut out he made an emergency landing on a stony field near Menzel Temime…..” which was in Vichy controlled North Africa. He was held as a POW until repatriated in November 1942 and then completed a full tour on Lancasters between January and June 1944 with 100 Squadron at Waltham. He has written a book There and Back - A Navigator's Story about his experiences. Sylvia is also an author. She has written two books under her maiden name, Sylvia Pickering - Tales of a Bomber Command WAAF and More Tales of a Bomber Command WAAF. She kept a horse throughout her WAAF service. Her civilian job as a trained shorthand typist/secretary lead to three postings after entering the WAAF on 1st January 1941: the first was as Clerk to the Station Armament Officer at 14 OTU RAF Cottesmore. After leave to nurse her dying mother she was posted in 1943 to RAF Coningsby as Clerk to the Station Medical Officers. 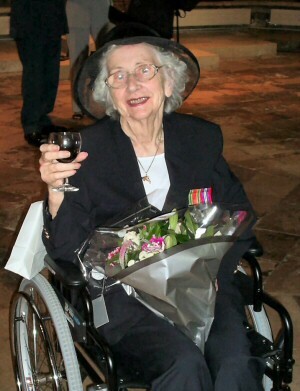 Here she gained a reputation as a trouble-maker and a bolshie and was posted 'in disgrace' to HQ 5 Group Bomber Command, Morton Hall, Swinderby. There she initially had a very difficult time with the WAAF staff in her work with the Group Defence Officers but ended the war as a Corporal. The day of the Ledger Stone dedication was her 84th birthday. A trumpeter played the Evening Hymn while wreaths were laid on behalf of the Bomber Command Veterans, the Royal Air Force and the Canadian Royal Air Force. amid the perils of the air. to those who watch and those who fear. of those who serve thee in the air. serene, unchallenged, day and night. all those in peril in the air. be with them whereso'er they go. and joyful hearts to thee ascend. If you have better or other images that might be shown, please contact the editor.